Milan leads the way - at least for what concerns the property market. The tide has turned since last year's downturn, and housing values in the northern metropolis are inching upwards, according to a report by Italian property portal Idealista.it. The Idealista study, which analysed the Milan properties advertised on the site in the third quarter of 2009, found that average prices for resale homes in the city grew by 2.8% to settle at €3,714 per square metre. Premium locations were the most buoyant. The Garibaldi-Porta Venezia area - where the new Citta della Moda, Milan's fashion district, is being built—experienced the healthiest spike, with prices increasing by 5.7% to shoot beyond the €5000 per square metre mark. 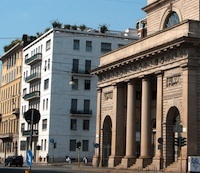 It is now the second most expensive location in Milan, after the historic centre, at €5,142 per square metre. The Vigentino Chiaravalle neighbourhood also performed well, recording a 5.1% growth and average prices of €3,281 per square metre. The third best location was the semi-central Navigli-Bocconi, where demand is partly driven by the local university's teaching staff and by (parents of) students purchasing investment homes. Values here grew by 2.3% to reach €4,925 per square metre. By contrast, the low end of the market was much slower. The worst hit was the peripheral Famagosta-Barona neighbourhood, where values dropped by 2.5% to €3,022 per square metre. Further down the property ladder, four out of the six areas with an average price of €3,000 per square metres or less saw values decline. Among these, the southern neighbourhood of Chiesa Rossa-Gratosoglio and the northern neighbourhood of Certosa experienced the greatest drops, to the tune of 1.5%. However, Milan's cheapest location remains the northern Vialba-Gallaratese area where values were virtually static at €2,534 per square metre. "The Euribor [interest rate]'s all-time low has helped prices hold in the Lombardy capital, especially favouring people who already had funding available and who took advantage of this moment of uncertainty to purchase a home," says Vincenzo de Tommaso of Idealista.it. "However, we have recorded a widening gap between the prices of top end properties and those for bottom end ones—testament that consumers are choosier and only willing to invest if they perceive a balanced price to quality ratio."